My memory of the 1990s is that it was not a great time for movies. That doesn't mean that there weren't great movies but rather the degree of consistency and the memorability of films left something to be desired. I'm sure this must be a false impression because there were so many films that I recall fondly from the times. It's just that the gritty seventies films were more meaningful and the bombastic eighties films were memorable. Truth be told, I can think of dozens of movies that came from the 1990s that I still love, OK cancel the first sentence of this post and let's start over. There are so many great movies from the 1990s that people remember and that defined the times. "Titanic", "Unforgiven", "saving Private Ryan", it may be tough for you to remember some of the second tier films that really made the decade sparkle. I have been meaning to share my thoughts on some films that I have thought of as "perfect" since the day I saw them. "Perfect" does not mean they are the best films ever made or that they are of such superior production that all other films should get out of their way. For my purpose here, "Perfect" means that there is not a note in the film I would change. There is an absolute satisfaction that comes, for me at least, from indulging in any one of these movies. The casting, script, line delivery, scenario, music or set design could not be improved upon by any additional time, money, or technology. The three films I am going to share with you here give me a warm glow in my belly, they put a smile on my face, and they make me long for the days when mid-level budgets and creativity were valued in the film community. Number One on my list is my guiltiest pleasure. We have a western, starring Sharon Stone. It is hard for me to explain to people that I love a Sharon Stone movie, much less a western that features her as a revenge driven gunfighter. Stone's career spent five years in the spotlight and she has been sliding down ever since. While never a critic's darling, she did have some worthy performances, but she became such a cliche of the sexuality of the times that she now mostly is a punchline. I still don't care, she was a hot woman with a gun strapped on her hip and she was trading western quips with some pretty great actors. The movie is basically a spaghetti western without the need for dialogue looping. The premise is a direct homage to Sergio Leone's "Once Upon a Time in the West", with several other nods to the Clint Eastwood films of Leone as well. Listen to the music and you can hear both the beautiful melodic theme of the film but also the comic bombastic dramatic flourish that accompanies many of the scenes. Listen to the last minute of the theme above and imagine the gunfighters stepping out onto the streets. It is perfect. I refuse to watch this film on any panned and scanned format because you will miss the reactions of the participants in the gunfights as they go on simultaneously. Director Sam Rami has a fetish with the camera and zoom dolly shots that just work perfectly in this movie. 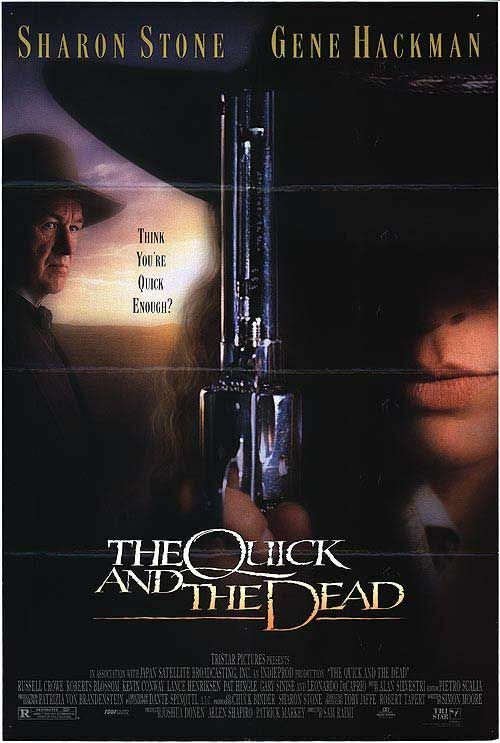 The Quick and the Dead Features a cast that is just incredible. You start with Sharon Stone, then add the great Gene Hackman in a villainous role that drips of snake oil. An exuberant young Leonardo DeCaprio appears and he looks about twelve years old but plays it just right as a wanna-be in a town full of scum. Also appearing, five years before he became an international box office star in "Gladiator", Russell Crowe plays a reformed gunfighter dragged back into this quick draw contest. Watch for five minutes and you will know that he was going to be a sensation, it was just a matter of time. Oh, and Gary Sinese shows up in flashback scenes and classes up the film even more. The story is repetitive because it basically features a series of showdowns in a sixteen person bracket gun-fighting contest. The film succeeds because it makes each of the gunfights worthy and interesting. There is a twist, a line of dialogue or a memorable screen shot that will stick in your head and leave you able to distinguish each of the fast draw contests from one another. Be careful if you watch below, there is a mild spoiler but a great Gene Hackman scene and a good illustration of the gunfights that went on in the movie. To this day, if this movie is on when I flip through the channels, I stop and I am mesmerized. Gene Hackman is so perfect and this was the third or fourth western he did in the early 1990s. "Unforgiven", "Geronimo" and "Wyatt Earp" all came just before this. Maybe the reason he stopped working is that there were no more westerns to make. I can't not look. This movie is a perfect homage to the western, a perfect performance from Gene Hackman, a perfect cast, and perfectly entertaining. If you disagree you are perfectly welcome to say so, as you stuff it. Every movie I go to see I want to be great. 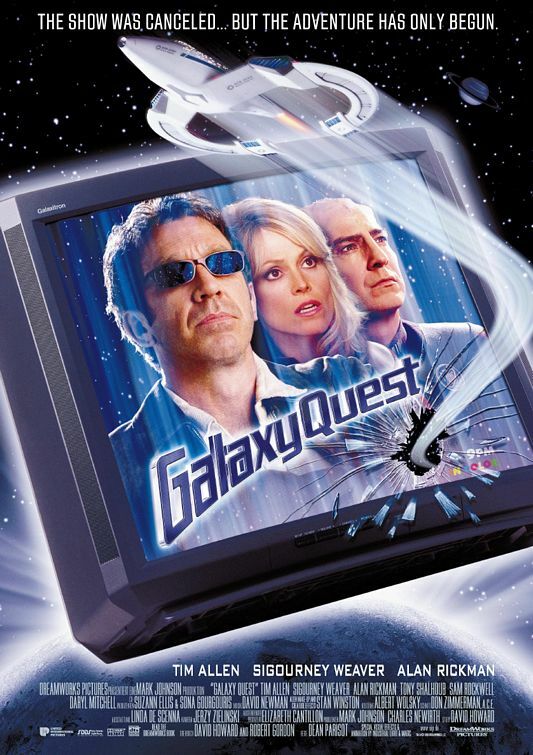 Most are not, a few end up amazing me, but I am not sure if I have ever been more entertained by and surprised by a movie than I was with "Galaxy Quest". It is a Science Fiction Comedy parody of "Star Trek" but at it's center is a heart as big as the galaxy. It starts out a little mean spirited and sour, but that is just so we can grow to appreciate how wonderful it is to be a fan and to be able to say that you touched other people with your work. Tim Allen plays a Shatner like character who is full of himself but dismissive of the work that got him to that point. In the cast is Sigourney Weaver in a comedy performance that shows what kind of acting chops she really has (that and a blonde wig and a push up bra turn her character into something to wonder at). Alan Rickman is one of the most under rated actors of the last twenty five years. His character in this is hysterical and grounded so much in the real world despite wearing the most inane make-up appliances ever created for a weekly TV series. Rickman has never been nominated for an Academy Award, even for his brilliant ten year sojourn into the world of Harry Potter. He could easily have been nominated for this role if comedies were not so easliy dismissed by the serious world of film acting. In the background of the story you have two of the greatest scene stealing supporting players of the last thirty years. Tony Shaloub can do comedy and drama with one hand tied behind his back. Here he plays it like he is a pot addled TV star with simply perfect timing. He is zoned out blissful in a way that never seems right except that it always works and gets the laughs that the story is going for. Earlier this week, I posted on a site that mentioned Sam Rockwell as one of the actors that you would see in anything. I'll agree and say that if you love Rockwell but have not seen this film, you may have missed his greatest role ever. He plays the third tier guest star that is clinging to what fame he once had but ends up living out the dream and nightmare of his one episode character. On "Star Trek" he would be a "red shirt", one of the many doomed actors who's character is not going to be coming back next season. Watch this clip if you have already seen the movie, if not, save it for actually watching the movie. Some one on line strung together his best scenes, it is a few minutes of perfection. What is so special about the movie at the end is that it take all the geeks to heart and treats the actors with the respect that they frequently miss but definitely deserve. I laugh at everything in this film every time I see it, and I have seen it a lot of times. It is not gross out humor or cheap one liners, it is humor based on the characters and the story and it is so worth your time. Warning: Consuming this film may result in a life long addiction that will drain time away from your busy life every time the damn thing shows up on the satellite. I don't always know why a movie connects with me so much. I just know that I love it and I wish everyone would share my love for it as well. "That Thing You Do", is just Pop perfection. The characters, the music, and the love story leave me feeling as if these people really were a part of my life. I can tell you this movie is perfect as it is because I have an extended cut of the movie that makes the film almost half an hour longer but very much weaker. 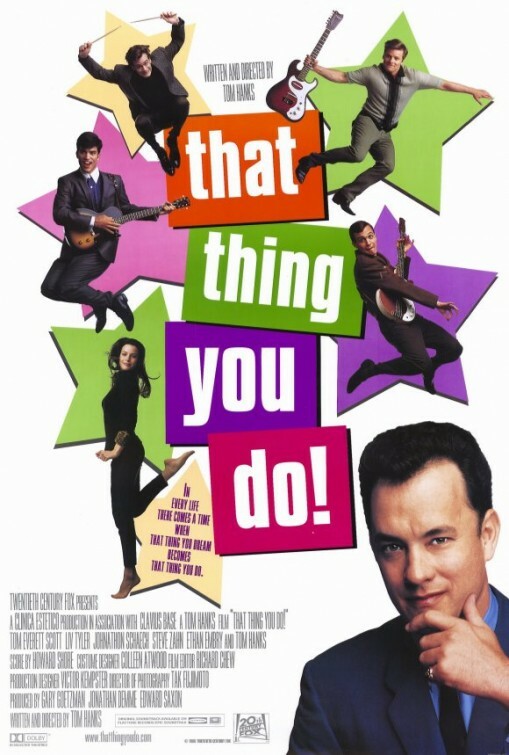 Tom Hanks wrote and directed this gem, and the editor he worked with prunes this film to a brisk focused piece of entertainment. I enjoyed seeing the extra footage one time, but I have never gone and watched it again because the theatrical cut is so satisfying. Set in the summer of 1963, the story tells of the rise and fall of a band with a big hit. The world is full of one hit wonders, and this film shows why so many talented acts may have only one song to contribute to musical history. It also shows why we should appreciate the magic that brings together all of the elements that make a song work. It may be the hook, or a lyric, or the tempo, or it may simply be the times. Eveyone will probably be sick of "Call Me, Maybe". This film shows how you can exploit a song and still not ever tire of it. The main song is worked out and played a half dozen times in the story but each time it feels fresh and we get to be inspired a bit more by the creative and romantic hearts behind it. I never played with a rock band, but I did do the fair circuit with my Dad's magic act, and he appeared on the Hollywood Palace, which is the show that the fictional Hollywood Showcase in this movie is based on. All of the show business stuff feels very real. Sitting down with the family to watch your family member appear on national television is exactly what we did in 1966. The TV trays and dinners were authentic as was the excitement. My older brother played the guitar and had the amps and speakers that these guys used in their early shows. The college talent show, the rock and roll all star theater shows and the fair circuit may be relics of the past, but they make us long for a less cynical time when playing for a crowd was the payoff, not the means to getting somewhere else. Tom Everett Scott is clearly standing in for a younger Tom Hanks. Hanks still gets to be in the movie as the ominous but supporting Mr. White, the record company A & R man. Liv Tyler is beautiful and sweet and when she delivers her denouncement of Jimmy, it is heartbreakingly real. Just as Sam Rockwell practically steals "galaxy Quest", Steve Zahn nearly makes off with this movie. His goofy guitarist has the personality that the band needs. When Mr. White refers to him as the clown, I don't think it is dismissive. He knows that a band need personality. My guess is that Ringo Starr may have been the least talented of the Beatles, but he was the one with the most personality, that freed up everyone else. Zahn's Lenny pushes the band to do new things, smash their way forward and do it all with an optimistic smile and a great laugh. There are another half dozen perfect characters in the story, the world weary cocktail waitress, the social climbing girlfriend, the obnoxious D.J., that all make the movie keep sailing. I especially like Guy's eternally frustrated father. Every line of dialogue uttered by the Dad is comic gold, laced with a little bit of resentment but a great amount of understanding. I don't know if Hank's own father was like this but there are millions of us out there that recognized that guy as our own fathers. If you can't find a couple hours of your life to watch this joyous miracle of a movie, I feel sad for you. Your life must be one of harsh hard work without the relief that comes from a few moments of relaxation. If on the other hand you do not work 16 hours a day or live in a shelter depending on the kindness of strangers to feed you, get up right now and find this movie. Put something in your life that is as perfect as your love for your favorite dog or cat, and see "That Thing You Do". The only thing you have to lose is sadness. Wonderful post, Richard. A great set of films, although I've yet to screen 'That Thing You Do'. Love that line about Hackman dripping of snake oil. The Raimi film finding getting the attentiona and appreciation it deserved. BTW, just last month the kids and I re-teed 'Galaxy Quest' -- probably in answer to ST: Into Darkness ;-). Simply wonderful. p.s., I'm taking my kids to see 'Earthquake' in SENSURROUND on Saturday at the Egyptian Theatre, in case you're interested in meeting up. I'm finally going to meet Dennis Cozzalio, too. If my company leaves early enough on Saturday, for me to sneak down there I'll e-mail you. We are going the next night for Father's Day to the Goldfinger/Indiana Jones and the Last Crusade Double Feature. Maybe you will be tempted by a double dose of Sean Connery. Thanks for coming by, and do "That Thing You Do", it is so worth it. That is a great double-feature, alright. We're heading out to a morning matinee for MAN OF STEEL on Father's Day, and back for me to catch the final round of the U.S. Open (annual tradition for me). If the clan is not planning anything that evening, I might be able to join in. I'll see. Thanks for the heads up, Richard :-).